State Sen. Wendy Davis' controversial decision to torpedo the 82nd Legislative session with a filibuster has catapulted the Fort Worth Democrat into the spotlight, which she has seized to try to mobilize the state’s downtrodden and outnumbered Democrats. Texas Democrats never had much hope in this Legislature, where Republicans have a huge majority and an unshakeable drive to slash spending without raising taxes or dipping into the state’s giant savings account. Don’t tell that to state Sen. Wendy Davis. The Fort Worth Democrat effectively torpedoed the 82nd legislative session by refusing to settle for a school finance plan that underfunded public schools by $4 billion. Davis’ Senate filibuster last Sunday night, which prompted Gov. Rick Perry to send exhausted lawmakers poised to adjourn after a grueling budget battle back into an immediate special session, has quickly gained legendary status. Longtime political observers say it surpasses former Republican Rep. Arlene Wohlgemuth’s 1997 “Memorial Day Massacre” — a single parliamentary move that killed dozens of bills — in notoriety. And it has catapulted the petite, eloquent and seemingly fearless political firecracker into the spotlight, which she’s seized to try to mobilize the state’s downtrodden and outnumbered Democrats and to take jabs at Perry’s potential presidential aspirations. The filibuster was a defining moment for Davis, a twice-divorced single mother who had her first daughter as a teenager, was the first in her family to go to college, and worked her way from junior college and a Tarrant County trailer park to Harvard law school and the Fort Worth City Council. But what effect, if any, the moment will have on school funding or Davis’ political future remains unclear. Some suggest it was a final hurrah for a Democrat angry over her party’s increasing ineffectiveness in a Legislature run by Republicans — and the recent GOP-led redistricting that severely threatens her reelection. They say if a special session moves the ball on school funding at all, it will be minimal, and instead opens the door for Perry’s other priorities, including the “sanctuary cities” immigration measure Senate Democrats successfully fended off during the regular session. And even if nothing changes with the school finance plan, they argue, at least parents, teachers and school districts will have the opportunity to challenge it. But others say it’s a watershed moment for a rising political star, who gave new life to disheartened Democrats with her efforts to derail a fly-by-night school finance plan, and lit up the Twittersphere with speculation about a Wendy Davis run for “U.S. Senate/Governor/President/Queen of the Universe/Whatever She Wants.” They argue laying the blame for a special session on Davis is ridiculous, because Perry already intended to call one for windstorm insurance and congressional redistricting. She confesses to being blindsided by the attention. In the rough and tumble world of social media, she’s been heralded as a hero and trashed as a traitor. Media outlets from around the state have descended on her office. But the always-polished Davis is handling it like a pro — one who may have higher political aspirations. After Perry effectively called her a “show horse” in a Monday press conference, Davis took him on, accusing him of using partisan tactics to help further “his presidential desires.” On Tuesday, after another Perry press conference, Davis ended up in the center of a media gaggle just feet from his office door. Though she said her first priority is winning a second term in the Senate, Davis wouldn’t rule out seeking other posts inside the state Capitol. Davis says she is not concerned. “I’ve never worried about payback,” she said. “People are hungry for leadership that’s not afraid of political consequence.” And unlike most lawmakers, who operate in a system of caucuses, coalitions and allegiances, Davis often behaves as if she’s got nothing to lose. Maybe it’s because she doesn’t. This session, Republicans redrew her Senate district in a way that ensures a tough — perhaps futile — campaign, and a likely legal battle over the new map. If the Texas Senate doesn’t work out, Davis says she’ll go back to practicing public and regulatory law, and with a good story. She was raised in Richland Hills by a mother with a sixth grade education, who supported her four children by working at a Braum’s ice cream shop. By age 14, Davis was selling subscriptions to the Fort Worth Star-Telegram and working at an Orange Julius in a shopping mall food court. By 19, she’d gotten married and divorced, and was living in a trailer park with her baby girl. “We were,” she says, “the working poor.” Despite her circumstances, Davis finished high school, junior college and Texas Christian University, where she graduated first in her class. She got remarried and had a second daughter. And she was admitted to Harvard Law, where she spent the next three years commuting back and forth between Boston and Fort Worth. Davis, whose daughters are now grown, got divorced again in 2003, and spent five terms on the Fort Worth City Council before narrowly defeating longtime lawmaker Kim Brimer in 2008 to enter the Texas Senate. 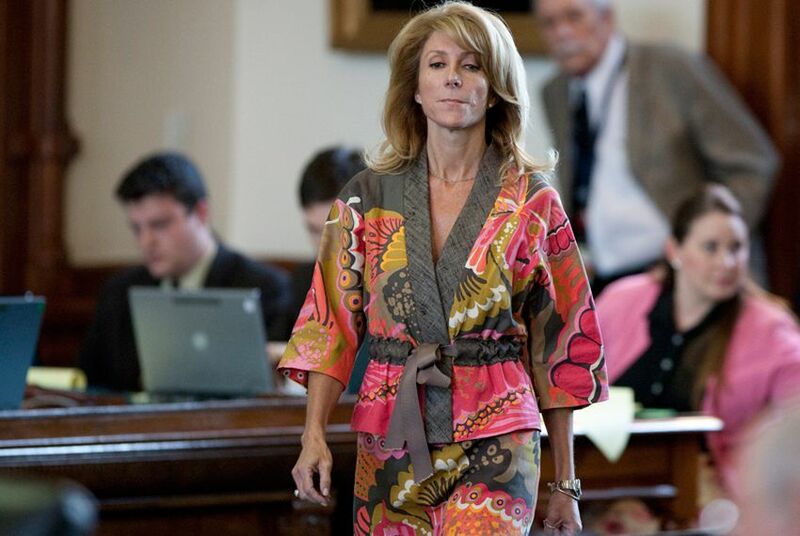 At the Capitol, Davis, who was named Rookie of the Year by Texas Monthly in 2009, is the subject of deep intrigue, from her romantic relationship with former Austin Mayor Will Wynn, to her fashion-icon status under the Pink Dome. The joke at the Capitol is that Davis is the only state politician with better hair than Perry. “I just fear we will end up in the same place with school finance, but have all this other risk — risk that for Hispanics, was not worth taking,” said Sen. Juan “Chuy” Hinojosa, D-McAllen.